Jeanette MacDonald Nelson Eddy Clearwater, Florida event! Jeanette MacDonald and Nelson Eddy fans! If you’re in Florida, join us in Clearwater on Saturday afternoon, October 30, from 1-4 pm. No tricks…but some treats! Light refreshments, a Q&A, book signing and I’ll show some interesting film and interview clips. Location: Ramada Limited Suites, 2061 Gulf-to-Bay Blvd, Clearwater, FL. Hotel phone: 727-446-8007. It’s conveniently located close to Hwy 19. If you’re coming from or through Tampa, you take the hwy 60 Causeway into Clearwater and the road turns into Gulf-to-Bay. Please spread the word to any friends or family that might be interested, and ask them to make their reservations. PS: If you’re coming from out-of-town and want to stay at the hotel, they are offering a $49.95 room if you mention you’re with the Mac/Eddy group. Reminder! June 26-27, 2010 Los Angeles events! Photo above: an aerial photograph taken a few years ago of the Nelson Eddy – Jeanette MacDonald hideaway house known as “Mists.” Those wanting to see this house should join us in Los Angeles for the last weekend of this month! 1. Saturday, June 26: a driving tour through the Beverly Hills area of the many homes owned by Nelson Eddy and Jeanette MacDonald. This tour will driving by most of their homes in Beverly Hills, Bel Air, Brentwood, the beach house Nelson bought for his mother (and stayed at himself) and – Mists, the hideaway home Nelson had with Jeanette! There is no extra charge for Saturday’s tour but we will need to coordinate with people and cars. After you get your tickets for the Sunday luncheon, you’ll be provided you with all the details. 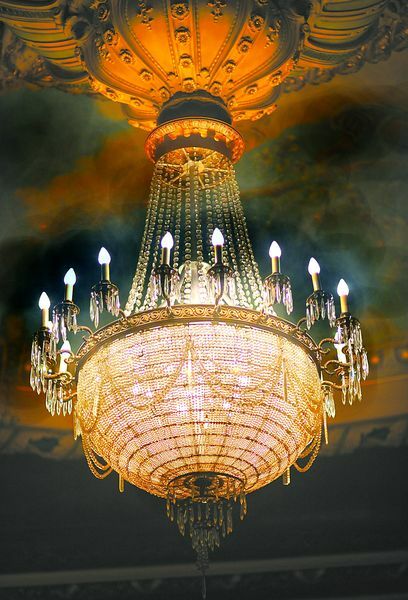 See Jeanette MacDonald Nelson Eddy “Maytime” Chandelier on March 13, 2010! The Jeanette MacDonald – Nelson Eddy story will be featured in the musical stage production of “A Scandalous Affair” on March 13, 2010. Location: Mishler Theatre, Altoona, PA. Tickets: $35. The show stars international opera singers Hallie Neill and Theodore Lambrinos (formerly of the Metropolitan Opera). “A Scandalous Affair” was written by Hallie Neill and and based on the best-selling biography Sweethearts by Sharon Rich. Rich will be a featured guest and will answer questions and sign books after the performance. This event is a fundraiser for the theatre. The Mishler website link is here and ticket info here. A highlight for Jeanette MacDonald and Nelson Eddy fans is that an original chandelier used in the 1937 movie Maytime was purchased at the MGM auction and now hangs in the Mishler Theatre. Sharon Rich was friends with Jeanette MacDonald’s older sister Blossom Rock (“grandmama” on the original TV series The Addams Family). Ms. Rock wanted her sister’s bittersweet life story told and authorized Rich to write it. Rich not only interviewed over 200 people in researching Sweethearts but also had access to Jeanette MacDonald’s unpublished autobiography, the unfinished memoirs of Nelson Eddy’s mother, plus hundreds of pages of handwritten love letters, diary entries and other contemporary source materials. Read a newspaper article about this event here.